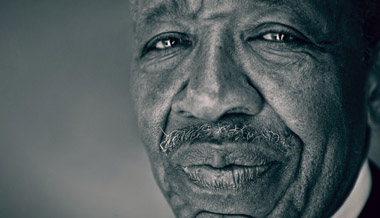 John M. Perkins is a sharecropper's son who grew up in New Hebron, Mississippi amidst dire poverty. Fleeing to California at age 17 after his older brother's murder at the hands of a town marshal, he vowed never to return. However after converting to Christianity in 1960 he returned to Mendenhall, Mississippi to share the gospel of Christ. While in Mississippi, his outspoken nature and support and leadership in civil rights demonstrations resulted in repeated harassment, beatings and imprisonment. He again was arrested in 2005 year while protesting in Washington D.C. against U. S. Government defunding of programs aiding the poor. In Mendenhall, Perkins and his wife, Vera Mae, founded Voice of Calvary Ministries. This Christian community development ministry started a church, health center, leadership development program, thrift store, low-income housing development, and training center. From this ministry, other development projects started in the neighboring towns of Canton, New Hebron and Edwards. Philip K. Reed, the previous pastor of Voice of Calvary Fellowship, has assumed the leadership of this dynamic ministry. In 1982, the Perkins family returned to California and lived in the city of Pasadena where Perkins and his wife founded Harambee Christian Family Center in Northwest Pasadena, a neighborhood that had one of the highest daytime crime rates in California. Harambee is yet standing, running numerous programs including after school tutoring, Good News Bible Clubs, an award-winning technology center, summer day camp, youth internship programs, and a college scholarship program. In 1983, while yet in California, Perkins and his wife, along with a few friends and other major supporters, established the John M. Perkins Foundation for Reconciliation & Development, Inc for the sole purpose of supporting their mission of advancing the principles of Christian community development and racial reconciliation throughout the world. His many books include the memiors "Love is the Final Fight", "Follow Me to Freedom," "Welcoming Justice," the autobiography "Let Justice Roll Down", "With Justice for All", "A Quiet Revolution" and "Linking Arms, Linking Lives". John Perkins on love and emancipation. John Perkins on Titus 2, grace and discipleship.